At Surrey Marble and Granite, our goal is to ensure that every single one of our customers is satisfied with the service and the stone work they receive. To make this happen, we provide a full service, from answering questions while you browse our samples through manufacturing and fitting to repair and maintenance work in years to come; full service stonework in Surrey and beyond. We know there’s a lot to know about stone. Our team has decades of experience and we’re still learning new things. Take advantage of our knowledge and ask any questions you might have during the design and material selection stage. As an example, if you’re thinking of installing a granite kitchen counter top, you may be picturing a dark grey stone with a matt or gloss finish. There’s more to granite than dark shades though, so we can show you the colours of the stone. Our workshop and showroom are open to visitors so you can see and touch samples of the stones, finishes and designs we offer. A visit is also a great opportunity to ask questions. Thinking of that granite kitchen work top again, you might want to know if the stone needs sealing, how to clean it, if there’s a difference in care needed between marble and granite and, of course, if the price is right for your budget. Stone worktops need to be fitted very precisely. Even a couple of millimetres or a quarter of an inch can be the difference between a piece that fits perfectly and something that looks wrong or doesn’t fit the space at all. Instead of relying on measurements, we create a full template of the space before cutting. This reduces the risk of error dramatically and also lets you design more creative shapes to fill your unique space. While most kitchen fitters have their pieces shipped in, often from abroad, we do the work ourselves here in Surrey. This gives us full control over the process, which in turn means that we can meet your particular specifications without breaking your budget. If we go back to that granite kitchen counter top for a moment, once our customer has selected their options, from rounded corners to a particular finish, our experienced manufacturing team will implement them matching the template exactly. Our installation team will liaise with builders, kitchen fitters or your site manager to ensure our installation fits in smoothly with other building or renovation work. As expert stone workers, we also provide maintenance and repair services to new and existing customers. 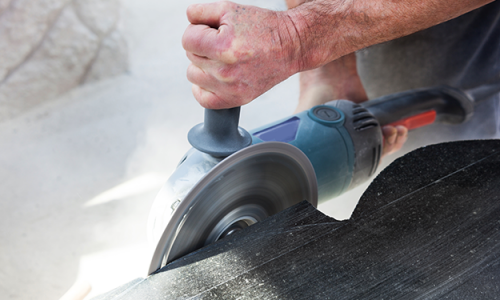 Stone is incredibly tough, but if you do manage to damage a granite kitchen work top or crack a tile in your stone floor, we can help you out.